We pulled into our driveway exhausted. Sunday is supposed to be a day of rest, but this morning felt like anything but. It was tiring not because of an early start with a meeting before church, the dressing of children, rushing out the door, conversations after the service, or even the disheartening news about a church member’s diagnosis. We were exhausted because our two kids couldn’t sit still or quiet in the worship service. It felt liked we’d experienced a tour of combat duty without any medals. The hour-and-a-half service could’ve been four hours with all the negotiations, warnings, and discipline that were required. The sermon consisted of three points, and between the two of us, my wife and I could recall one. Unfortunately, this week wasn’t unique. Hadn’t we just performed this seven days ago? Hadn’t we worked with our children each day since, so that his week’s worship would be better than last week’s catastrophe? Was it all for nothing? 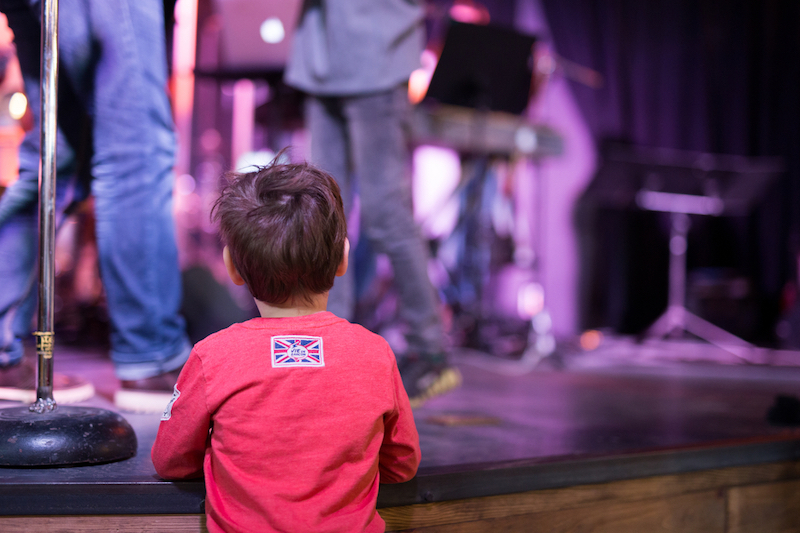 In the early days of bringing young children into worship, it can feel like self-inflicted torture with no end in sight. But as much as it may prove a struggle, the effort is worth it. Church services provide numerous opportunities for blessing. Here are three. 1. They’re present in the midst of the means of grace. The most important part of a local church’s life is corporate worship, because in the weekly worship the Lord uniquely meets with his people by his Word and Spirit. He ministers to us by the ordinary means of grace. Churches and parents can chase after innovative programming to influence their kids, but corporate worship is what the all-wise God has ordained. These ordinary means of grace are effective for everyone, including children. The more we place kids in the way of them, the more opportunities they have for their souls to encounter the God of grace. God attaches promises to his Word. The Word does not return void (Isa. 55:11). It’s at work as we hear it read and preached. It’s living and active, sharper than a sword (Heb. 4:12), and it alone sparks faith (Rom. 10:17). We want our children to hear it proclaimed with power. The sacraments are visual presentations of spiritual truths. We can see, taste, smell, and feel the realities of God’s grace. This fact isn’t lost on our children as they see these sacraments practiced. The children of Israel asked their parents while they participated in the Passover, “What does this mean?” (Exod. 13:14; Deut. 6:20). In a similar way, our children will have questions about what they see and hear. We answer by pointing them to a Savior who willingly died for his own. Prayer shapes and aligns our hearts with the will of God. As our children bow their heads and listen to the congregational prayer or the prayer of confession, they can’t help but hear of truth and grace. It’s beautiful when they eventually join in. It’s important for kids to participate in the corporate worship every week. The constant routines of our life possess a formative power, and children who attend church every week will be formed by the means of grace. 2. They’re present in the midst of the whole congregation. Corporate worship is corporate; the entire body gathers. As the congregation sings, all the voices of the church unite. When God’s people read the confession of faith, they confess the same truth in unity. When God’s people hear the public prayers, they voice a loud “Amen” together. Children benefit from witnessing and participating in this unity. Children pay special attention to their parents. They learn by observing their parents and discerning what their parents deem important and what gives them delight. Bringing our children into worship lets them observe the importance and delight of corporate worship in the life of their parents. If they aren’t in worship, they won’t ever see that delight, and few things have greater effect on our children’s spiritual lives. Children learn from their parents and the rest of the congregation, but they also set an example for the covenant community. When Jesus blesses the children, he says: “For to such belongs the kingdom of God. Truly, I say to you, whoever does not receive the kingdom of God like a child shall not enter it” (Mark 10:14–15). Many consider children a distraction in corporate worship, but in Christ’s eyes, they’re an example. 3. They’re present in the midst of God’s story. The Bible clearly articulates the duty of parents to instruct their children in the things of the Lord. Psalm 78 provides one of the most beautiful statements of this calling. Asaph reminds his generation that they must pass on the glorious story of their faith to their kids. We tell this story each Lord’s Day morning as we gather—and as our children participate in the worship, they hear this story. They can’t miss it. Our children take part in the practices of the covenant community, which picture God’s mighty acts and his relationship with his covenant people. They enter the great academy of the Christian faith. We teach, instruct, and form our children into worshipers. Of course, only God can call people to himself and make hearts of stone into hearts of flesh (Ezek. 36:26), but participating in the worship of God shapes our children. Our children also learn that God is for them. When we include children in worship, we communicate that they can worship the one true God. Christianity isn’t an adults-only religion, and worship isn’t adult-only either. God calls on all people to worship. When we exclude our children from worship, we communicate that the things of God and his story aren’t for them. My kids love candy, so I never need to encourage them to eat candy. Vegetables present another story, but my wife and I labor to see them eat vegetables daily. Why? We do so because we know the benefits that flow from eating them. The fiber, vitamins, and nutrients found in vegetables encourage us to fight the good fight of getting a little green in their diet. We know the benefits from such a diet could influence their lives for the next 20, 40, 60, or even 80 years. It’s worth the struggle. And the benefits that flow from including our children in corporate worship can affect their lives not just for 80 years, but for eternity. If green beans and broccoli are worth the struggle, a season or two of difficulty in the pew is more than worth it. Editors’ note: This is an adapted excerpt from Jason Helopoulos’s book Let the Children Worship (Christian Focus, 2016). Jason Helopoulos is senior pastor of University Reformed Church in East Lansing, Michigan, and is the author of A Neglected Grace: Family Worship in the Christian Home (Christian Focus, 2013). Jason and his wife, Leah, have two children, Gracen and Ethan.